By providing a method that effectively addresses the psychology of change, we've unlocked employee willingness to participate as full partners in Lean Six Sigma improvement and delivered bigger returns on investment. The fad stage may be over, but Lean Six Sigma remains the most widely-deployed quality and process improvement method in large organizations. In the face of tighter budgets and greater pressure for results, however, Lean Six Sigma deployment leaders need to embrace innovative ways of engaging their organizations in continuous improvement, but without the expense associated with conventional Lean Six Sigma staffing and training. Read how a growing number of organizations have found the answer to sustaining and expanding Lean Six Sigma results by taking a different approach to engaging the rank and file in Lean Six Sigma "thinking and doing." In spite of its many publicized successes and its acceptance as the gold standard of continuous improvement methods, Lean Six Sigma is no longer seen as a "no brainer" investment by executives. Over the past five years, many organizations with highly-publicized deployments have reduced their ranks of full-time Black Belts, while simultaneously abandoning the expectation that every manager and employee receives training and participates in Lean Six Sigma projects. The big gap for Lean Sigma is with the rest of the organization, which is often left sitting on the sidelines of the improvement game. The problem with Lean Six Sigma is not the methodology. The strategy of equipping a small cadre of internal experts (Black Belts) to lead projects aimed at resolving complex process problems requiring statistical analysis has been proven effective time and again. The big gap for Lean Six Sigma is with the rest of the organization, which is often left sitting on the sidelines of the improvement game. Most rank-and-file managers and employees in today's time pressured, downsized workplaces see Lean Six Sigma as something "I just don't have time to deal with." The consequences of low employee engagement in Lean Six Sigma (reported to be less than 10% for Lean Six Sigma organizations according to a study by the American Quality Foundation) is money left on the table when measured on the basis of improvement opportunities. 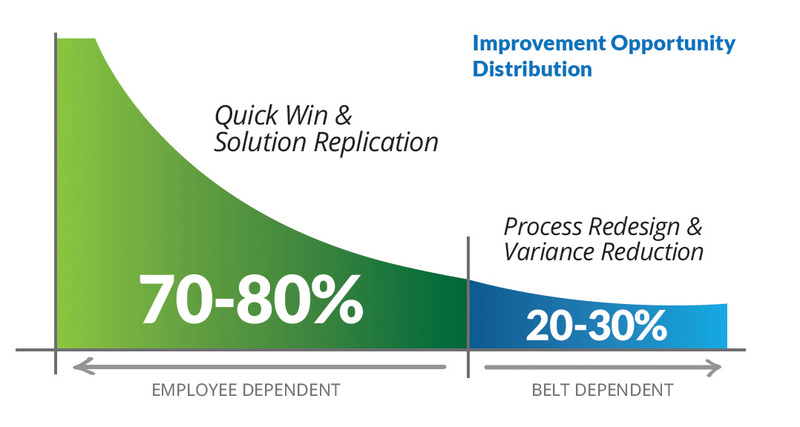 As depicted in the illustration below, a greater percentage of an organization's improvement opportunities do not require typical Black Belt study and analysis. However, capturing these "low fruit" or quick win opportunities (as referred to in Lean Six Sigma parlance) requires a reliable, cost-effective and motivating approach for engaging employees. The answer to closing Lean Six Sigma's employee engagement gap and resulting lost opportunity to boost results is not training more Green Belts (non-full-time Lean Six Sigma project leaders) or moving Lean Six Sigma training online to increase access and reduce cost. A study conducted by Leap Technologies involving 50 of the largest Lean Six Sigma deployments in the U.S. found that Lean Six Sigma project completion by newly-trained Green Belts was less than 50%, and the number completing a second project was no more than 15%. On issues of quality, customer satisfaction and operational effectiveness, frontline employees have an abundance of ideas for solving problems, but little patience for slow-moving, complicated improvement processes. Employee motivation to participate on improvement projects is directly related to the ease and speed with which ideas can be shared. The willingness of employees to give discretionary effort to test and implement solutions diminishes rapidly when meaningful improvements are not realized quickly. What's missing in conventional Lean Six Sigma deployments is a complementary method and reliable toolkit designed to motivate and sustain productive employee engagement. Lean Six Sigma's conventional DMAIC (Define, Measure, Analyze, Improve & Control) project methodology, as well as simplified variations such as the A3 Process popularized by Toyota, are rooted in a scientific, data-based approach to problem-solving. These methods are very effective at finding root causes and testing solutions. In the hands of inexperienced Belts, however, these methods can be detrimental to the cause of inspiring employee engagement, especially given the time demands, ease of understanding, and level of personal satisfaction experienced. What's missing in conventional Lean Six Sigma deployments is a complementary method and reliable toolkit designed to motivate and sustain productive employee engagementengagement that pulls rather than pushes employees toward Lean Six Sigma thinking and practice. Download the same tools this company used to start their rapid improvement project. Engage employees in Lean Six Sigma where they can make an immediate impact. Lean Six Sigma improvement opportunities are not equal in scope, complexity, tools required or results potential. While frontline employees can certainly make a contribution, Black Belts lead the way and get the accolades on complex process improvement projects. Employees "get fired up" when they are invited to participate in projects that directly impact job satisfaction and for which they have the most know-how and motivation: Daily work process improvement and best practices adoption (the 80% improvement domain). Energize employees by making it easy for them to share and develop their ideas for improvement. Complex, foreign concepts mute employee participation and dampen enthusiasm for improvement projects. In order to gain employee attention and generate a willingness to provide discretionary effort, an organization must move as quickly as possible from presenting the problem to opening the floor for ideas. While soliciting solutions before verifying the problem may seem contrary to the "facts and data" doctrine of Lean Six Sigma, it is simply a different starting point for beginning the problem-solving process. It signals to employees a respect for their experience and know-how, while creating interest and enthusiasm to pursue solutions. In our experience, when the proper techniques are employed to brainstorm ideas and then analyze their merits, employees respond enthusiastically, and, in the process, increase their commitment to participate further. 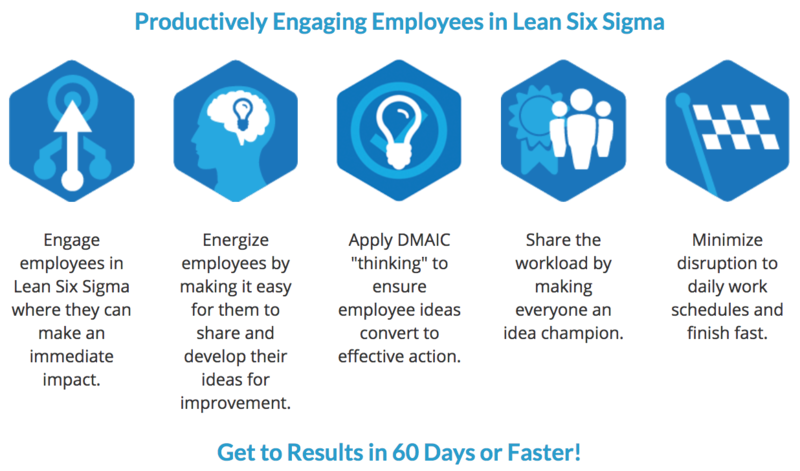 Apply DMAIC "thinking" to ensure that employee ideas convert to effective action. The DMAIC model, effective in guiding complex, Black Belt-led projects over many months of work, can also be used on a "micro-level" by frontline employees to test and refine improvement ideas. Instead of applying the method across a series of project milestones, employees engaged in quick win and best practices localization projects can use DMAIC in a discussion guide format to ensure Lean Six Sigma application prior to recommending an idea for implementation. Share the workload by making everyone an idea champion. Black and Green Belts alike often say the most difficult aspect of leading a Six Sigma Project is getting team members to complete assignments. Lean Six Sigma projects attempting to engage frontline employees, particularly for the first time, can overcome this barrier by operating with a simple ground rule: The opportunity to share ideas brings with it the responsibility to do the work required to put at least one idea into action. The principle of sharing the workload benefits quick win and best practice localization projects because these opportunities typically require many actions to produce results. Minimize disruption to daily work schedules and finish fast. Time is the enemy when it comes to employee engagement in Lean Six Sigma. From start to finish, Lean Six Sigma projects that engage frontline employees need to operate on a principle of minimum hassle and maximum return. Our experience with thousands of frontline improvement teams shows that employees get and stay engaged when projects operate with effectively-designed meetings that teach tools and concepts on a "just-as-needed", not "just-in-case" basis. Equally important in frontline applications is for projects to cross the goal line in 60 days or less. Over the last decade, Leap Technologies has had the opportunity to work with several Lean Six Sigma Deployment Leaders on issues related to low employee engagement. Our Rapid Action process and toolkit has proven to be a highly-profitable way to engage small teams of employees in rapid problem-solving and solution implementation, and in a way "pulls rather than pushes" employees to adopt Lean Six Sigma thinking into their jobs and interactions. Bob Crescenzi, a nationally recognized Lean Six Sigma Deployment Leader for a number of Fortune 500 companies over the past 15 years, pioneered the integration of Rapid Action into Lean Six Sigma. As Crescenzi explains, "While I was attracted to Lean Six Sigma early on as a more structured and measureable method for driving improvement using expert change agents, I was uncomfortable with the lack of attention to frontline employee engagement." "That's why I partnered with Leap Technologies to seamlessly integrate their Rapid Action toolkit and team process into my Lean Six Sigma Deployments. By providing a method that effectively addresses the psychology of change, we've unlocked employee willingness to participate as full partners in Lean Six Sigma improvement and delivered bigger returns on investment."